Today is December 31st, the last day of 2014. 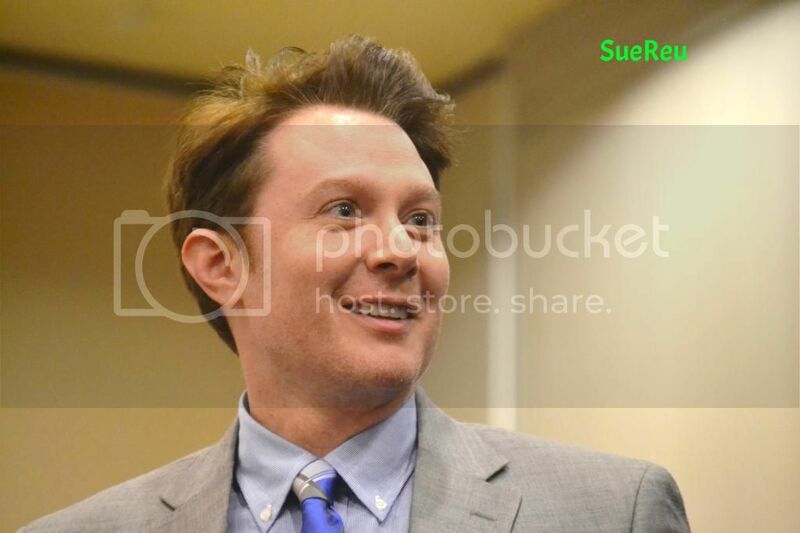 I thought it would be interesting to take a moment and choose some standout moments for Clay Aiken in 2014. Looking back on the year and picking only a few events is not easy. Some of you will agree with my picks and some will wonder why I left out one of their special moments. Hold on to those ideas and please share them with us in the New Year. As always, your comments are appreciated. 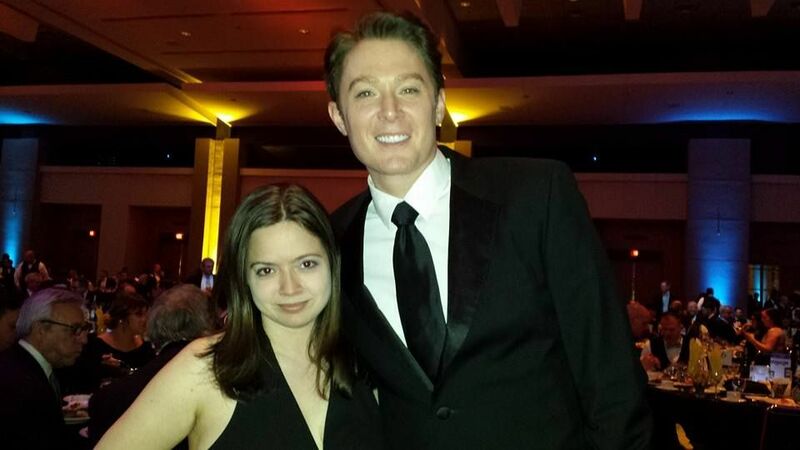 February 22, 2014 – Clay Aiken attended the 2014 Human Rights Campaign Gala. Held at the Charlotte Convention Center, the event included a silent auction, Reception, Dinner, and a star-studded Program. There were approximately 1,500 gay and straight allies at the 19th annual Human Rights Campaign Gala. It was a black-tie fundraiser for the LGBT community in the Carolinas. I learned that night that the Human Rights Campaign is the largest LGBT civil rights advocacy group and political lobbying organization in the United States. According to the HRC, it has more than 1.5 million members and supporters. 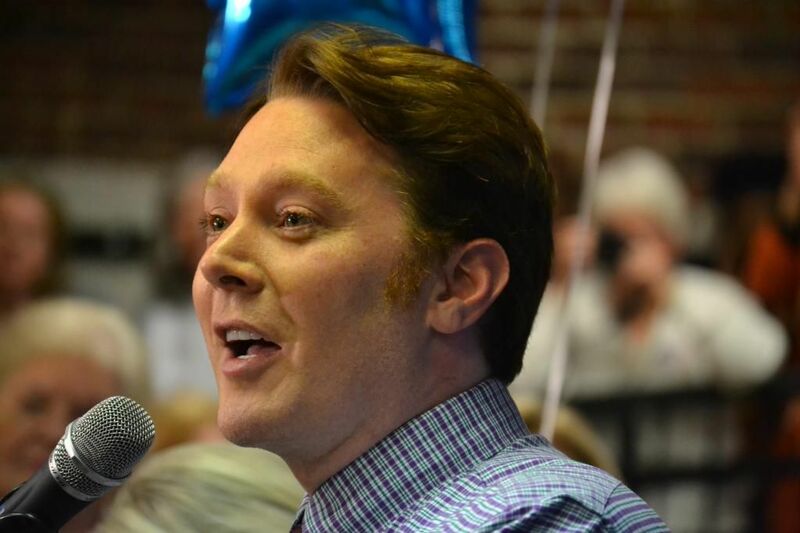 Clay Aiken officially filed to run for North Carolina’s 2nd congressional district on Thursday, February 27, 2014. 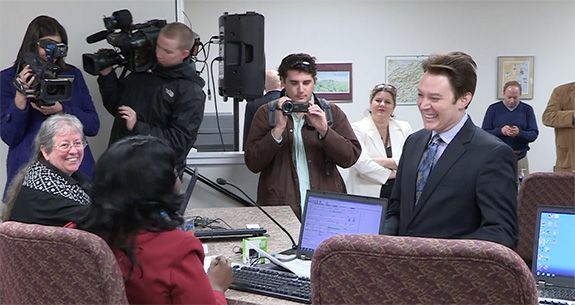 The media was on hand for Clay’s arrival at the State Board of Elections in Raleigh as the singer was accompanied by a small group of supporters, including his mother and his former second grade teacher. After paying the $1,740 fee to run for Congress and completing the required paperwork, Aiken fielded questions from reporters. Colbert, a South Carolina native, welcomed Clay Aiken, but in the tradition of the show, Stephen didn’t show him much Southern hospitality. The following is some of the conversation. “I think people are kind of fed up with the kind of tone-deaf representation they’ve had,” Aiken said. “Tone-deaf? Just because you have perfect pitch? That’s kind of cheap,” Colbert answered back. “I will happily admit that partisan political bickering is how I make my living,” Colbert said. “It’s exactly how people in D.C. make their living, too,” said Aiken. 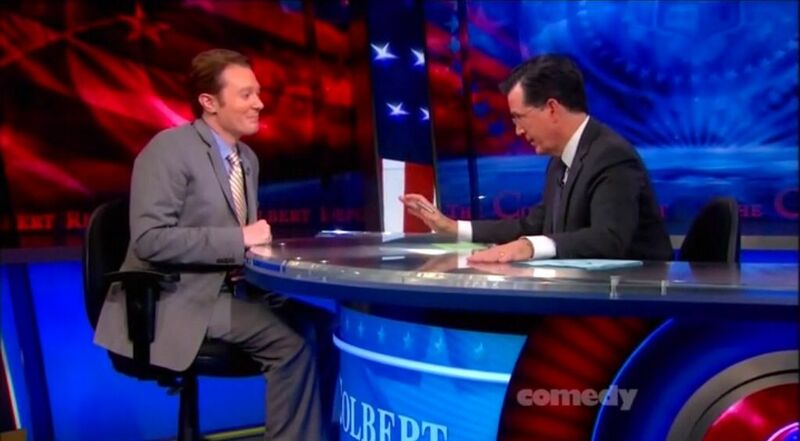 Colbert tried to get Clay to duet with him on The Star-Spangled Banner, but Aiken said he’s on sabbatical from singing. 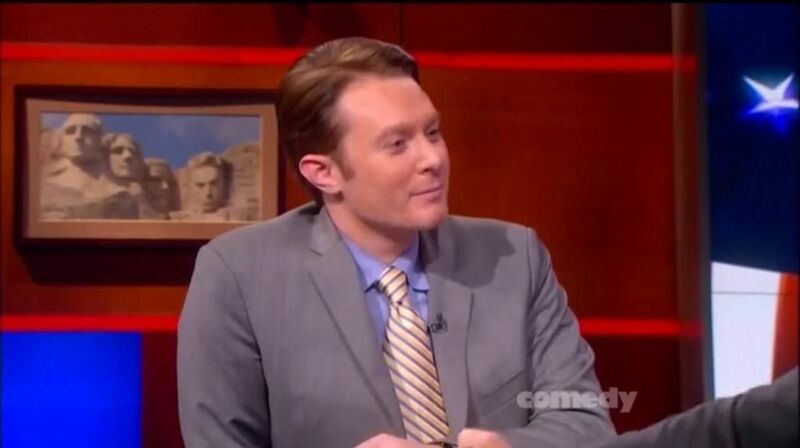 “Headline: Clay Aiken refuses to sing national anthem,” said Colbert. Clay was on many national TV shows during his campaign for Congress, but this particular show introduced Clay to a different audience and twitter woke up that night with positive remarks and comments about Clay. 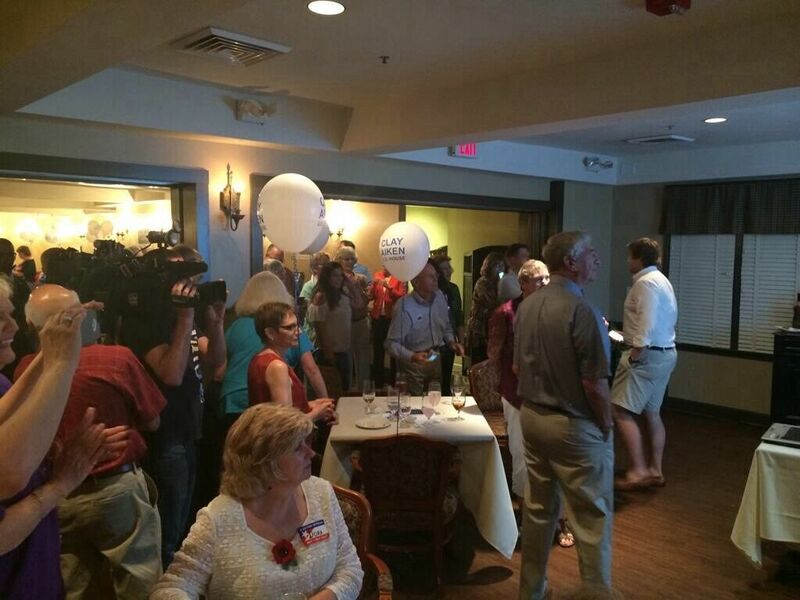 …Aiken, the former “American Idol” runner-up, held a watch party in Holly Springs. His surprise entry into the Democratic field drew national attention. 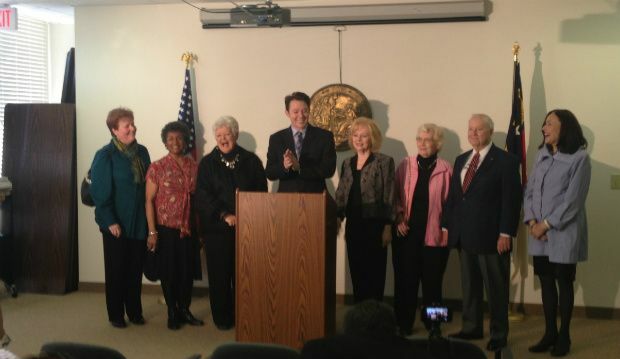 Aiken has campaigned on a platform that includes being an advocate for kids with special needs. But Crisco’s campaign questioned why Aiken usually missed meetings of the Presidential Commission for People With Intellectual Disabilities. 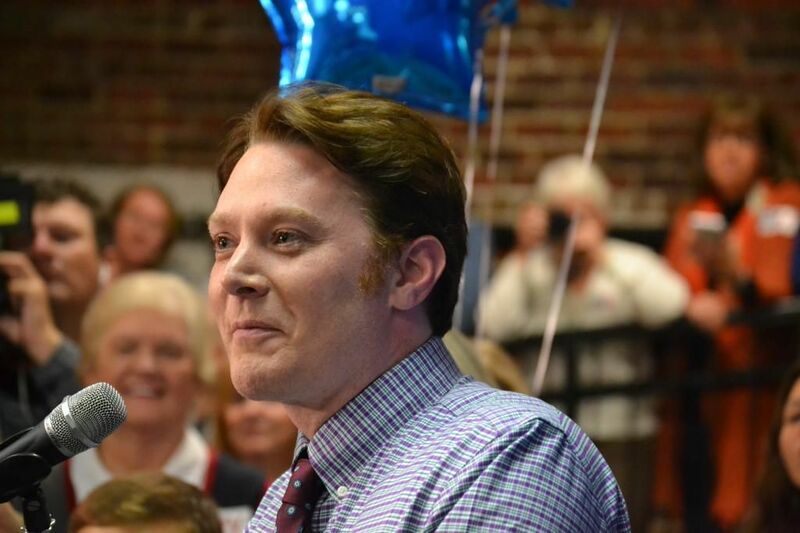 Aiken, speaking late Tuesday night after a long evening of watching results, thanked his supporters and, while acknowledging he had not yet officially won, predicted victory in November. “I am very confident we are going to be victorious in November as well,” he said. He vowed to go to Washington to change the negative tone there. The next day, Clay was busy visiting schools and senior centers. 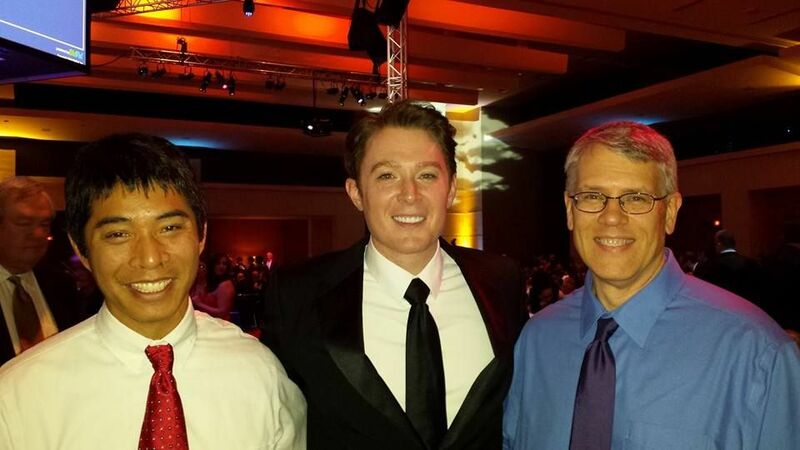 The National Inclusion Project Champions Gala took place in Raleigh on September 19-20, 2014. This annual celebration and fundraiser is an amazing event. On Friday The Founders’s Reception was held at the Marriott and there were about 200 people in attendance. 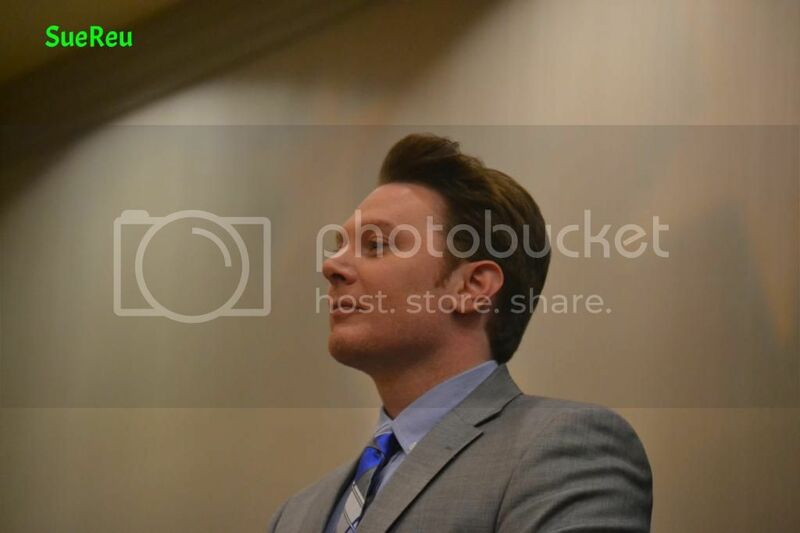 The special guest speaker was D.J. Svoboda, a young man who was diagnosed at the age of 3 with Autism Spectrum Disorder. Today, D.J. is an dynamic, motivational public speaker, accomplished artist and author with three books to his credit. After reports on the progress of the organization, The evening ended with two auctions…the first was a dinner with Clay for 10 people. The excitement of the bidding grew as it reached the winning bid of $28,000. Two bids tied so Clay offered the dinner to both bidders. Next, Clay introduced Tucker who had a surprise for another auction. She opened the box and pulled out Clay’s green plaid shirt. After a busy bit of bidding, the shirt was bought for $2,500. 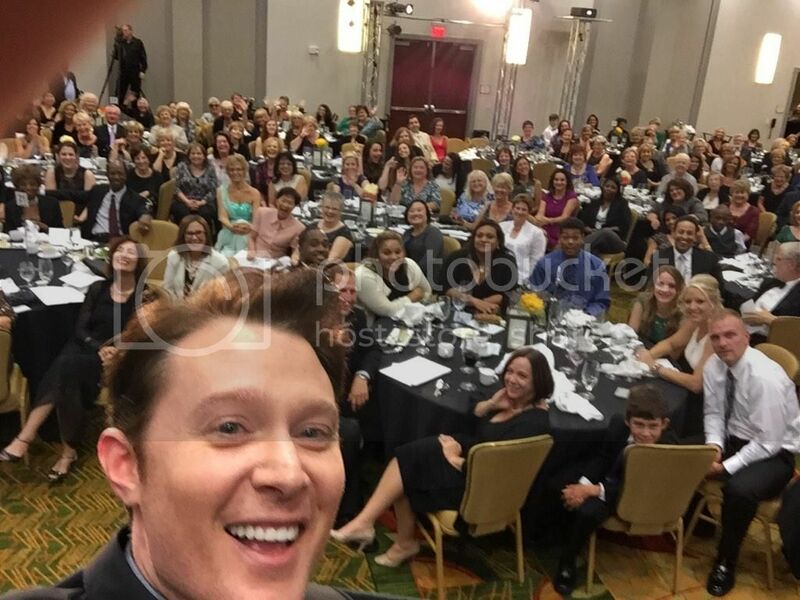 Saturday night was amazing…wonderful entertainment, exciting honorees and lots and lots of love!! November 4, 2014 was the general election in the United States. 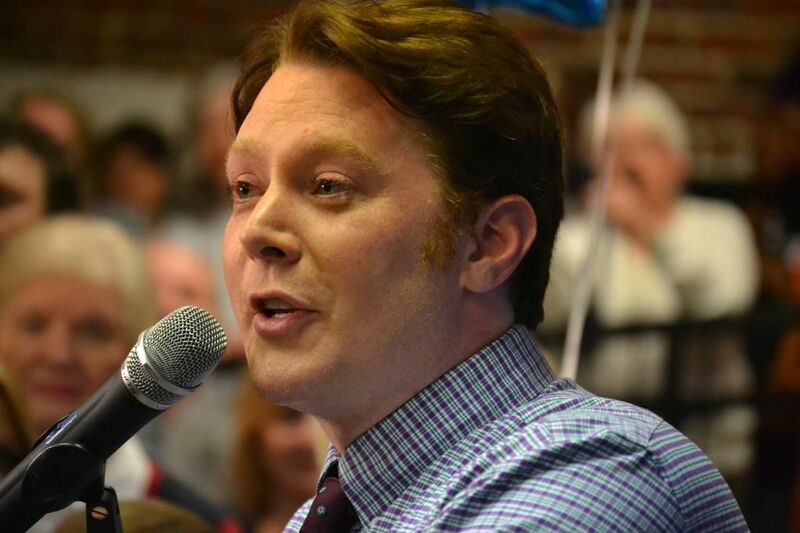 Although the results for Clay Aiken were not what any of us wanted, I am so glad that I was there to experience the love, support, friendship, and determination that I witnessed. Although none of us are sure exactly what Clay’s next project will be, I hope he knows that he has a large group of supporters who are here and ready to help in whatever way we can. Error: Error validating access token: Session has expired on Tuesday, 21-Aug-18 16:13:01 PDT. The current time is Thursday, 18-Apr-19 06:51:57 PDT.